The stock price slump that has plagued IBM investors for years could be reversed by these key developments. Shares of International Business Machines (NYSE:IBM) have fallen about 30% since peaking in 2013. The stock has been walloped again and again by disappointing results. Revenue has declined on a year-over-year basis for 16 straight quarters, and all of the share buybacks in the world couldn't prevent IBM's earnings from dropping as well. Despite the company's lackluster results in recent years, IBM remains extremely profitable. Big Blue is investing heavily in growth areas such as cloud computing and analytics, and through those efforts, the company is building the foundation for future growth. There's still a lot that can go wrong for IBM, but there are a couple of things that could drive IBM stock higher in the coming years. 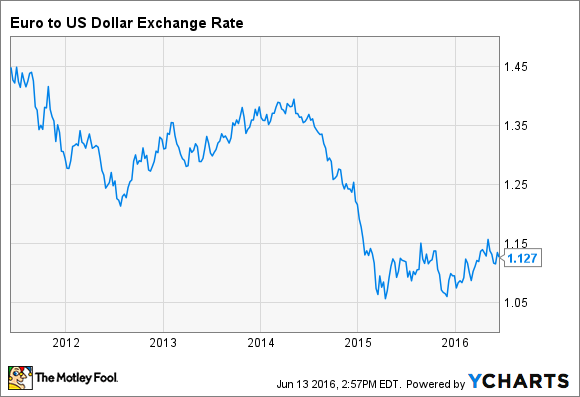 Euro to U.S. Dollar Exchange Rate data by YCharts. A strong U.S. dollar led to major declines in revenue for IBM due to currency translation. In 2015, IBM reported a 12% decline in revenue, but 8 points of that decline, or about $7 billion, was due to currency. Another 3 points was due to divestitures; adjusted for those two items, IBM's revenue declined by just 1%. The good news is that exchange rates have been more stable over the past year, and IBM has lapped the steepest changes. The bad news is that the roll-off of currency hedges this year will have a major negative impact on the company's results. IBM expects its pre-tax profit to be reduced by $1.3 billion in 2016 because of currency. These currency issues have little to do with the business itself, and once all of the currency-related losses are lapped, the company's reported and adjusted results should converge. The double-digit revenue declines of 2015, which seem to have fostered an image of a company in disrepair in the minds of investors, will be replaced with less headline-worthy performance. 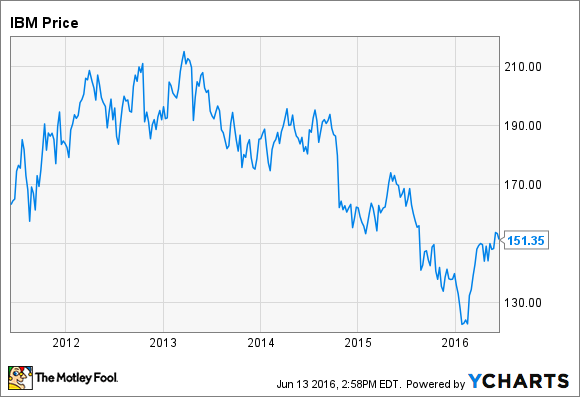 Part of what's holding IBM stock back is pessimism among investors. The end of the company's currency woes could flip the script and send shares higher. As I've argued in the past, IBM is not trying to become the largest cloud infrastructure provider. Amazon's AWS holds that honor at the moment -- and will for the foreseeable future. IBM's infrastructure-as-a-service business, SoftLayer, is small, around one-tenth the size of AWS. But the company's cloud strategy goes far beyond infrastructure. IBM's total cloud revenue has reached a $10.8 billion annual run rate, and its delivered-as-a-service cloud revenue run rate sits at $5.4 billion. IBM's focus is on enterprise customers, and its base of existing clients gives the company a significant advantage. IBM CFO Martin Schroeter recently stated that the company is becoming more of a services integrator rather than a systems integrator, reflecting the shift toward cloud computing, particularly hybrid cloud. IBM's cloud revenue has been growing at a rapid pace. During the first quarter of 2016, total cloud revenue rose 36% year over year, adjusted for currency, while the cloud-as-a-service annual run rate jumped 46% compared to the same period last year. Some of this growth is being driven by acquisitions, which IBM is using to build out its cloud platform and make strategic bets in areas like healthcare. As many of IBM's legacy businesses decline, the company needs to keep up the growth in its cloud business. That means signing service deals with an increasing amount of cloud content, getting developers to use Watson and other cloud services to build applications, and successfully selling clients on the benefits of a hybrid cloud setup. Ultimately, returning to growth will require IBM's growth businesses to become large enough to counteract weakness elsewhere. Once that happens, the pessimism currently baked into the stock price could become a thing of the past.